In the sequel to A Story of Now, Claire Pearson has already learned a few things this summer. Like falling for a girl is easy. Well, it is if that girl is Mia. What Claire hasn’t learned yet is that now comes the hard part: learning to trust in this new relationship. And that isn’t easy when no one has ever given you a reason to trust before. Then there’s the pressing question of what to do with her life. Claire’s new volunteer job working with kids offers a glimpse of a potential future, but it definitely isn’t something her pushy mother is going to like. Still, everything feels hopeful as she embarks on the next chapter of her life, armed with new friends and the warm and funny Mia. But Claire quickly discovers that negotiating this new terrain of adulthood isn’t easy. Over the rest of this momentous summer, the biggest lesson Claire must learn is how not to let anything get in the way of her happiness. Especially herself. 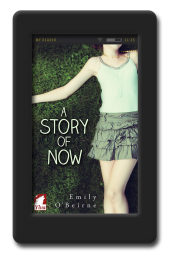 Sequel to “A Story of Now” has us continue to follow Claire and Mia through a summer of relationship building, in the present tense, week by week or even day by day. I quite loved the book and the characters and smiled to myself as I read all too frequently. I was hesitant to read this though, once I began, even though I pre-ordered the book, as sequels are frequently a let down after the first book, aren’t they? I ‘loved’ these characters of Claire and Mia so much I didn’t want anything to happen to them or their relationship as I was in the story somehow, made young again in some sort of magical romance at the same time grasping for a direction to follow as I entered adulthood. Perhaps I am too indulgent with this author in that nothing tumultuous really happens externally to the two main characters besides ghosts of past bad feelings surfacing again in the present moment and fowling up everything so that everything must be built again. Because this relationship is an everything kind of relationship. So. Sorry. I cannot review this book with any sort of criticism. I was charmed from the beginning by the characters, major and minor, and want the author funded so she can write me more stories about this Melbourne world she has created for me. Do you know that feeling where you totally excited but kind of terrified at the same time. Kind of like the start of a marathon you’ve been training months for, you know it’s going to be fine, but you really want that great race. That is how I felt a few days ago when I started Emily O’Beirne’s newest book The Sum of These Things (A Story of Now #2). I absolutely adored her first book, A Story of Now. It unexpectedly stole my heart, and became one of my absolute favorite books. So, you can see how a sequel to one of your favorites is going to be either a renewal of you love or an utter disappointment. 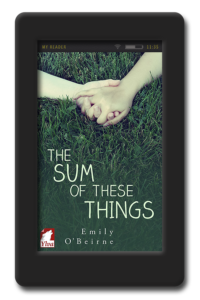 Well, I can honestly say Emily O’Beirne did a number on my heart again, everything, and I mean everything about this book was spectacular. Mia and Claire are two amazing characters. They are so different from each other, and yet their relationship so spectacularly works. Each of them has her own character flaws, and it is the other’s strength. In the last book (pause if you have not read the last one, go get it now, read this later! ), we saw how Mia wavered with her sexuality, second guessing Claire’s interest in her and finally making that giant leap of faith and getting the girl. Claire was the strong one, while never being in a relationship with another girl, she didn’t make a big fuss about it, and it wasn’t a huge deal to her. She liked Mia romantically and that was enough. In this latest book, Mia is the quiet strength of the duo. 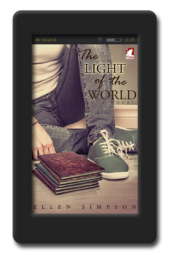 While the romance is alive and well between Claire and Mia, life tends to get in the way of that all-consuming love. Claire goes from being super slacker to being right on the cusp of getting her life in order. She is applying herself in regards to figuring out who Claire wants to be. She tends bar to have a cash flow, but she has begun volunteering at a community center for kids as well. Her days are filled with playgrounds and grant writing, and her nights filled with slinging booze. While Claire is running ragged, Mia has much more free time before she begins her medical studies. Here is where the conflict of the book lies. Mia’s freedom is where Claire’s insecurities find a foothold. Claire is confident in who she is, but she also has insecurities. In her mind she often questions, “Is she enough for someone”? Her mother’s constant slights over time have worn her down, and her failed past relationship with Brendan has made her take pause when Mia begins to flourish socially. She begins to question her worthiness. The conflict is understandable and relatable, and the dialogue is what makes this book flat out amazing. In my opinion, Emily O’Beirne does dialogue and character development with the best of the best. The interactions between the characters are the highlights of the book. The dialogue is how real people talk, whether they’re flirting, romancing or fighting, it is just good! Sequel to “A Story of Now” has us continue to follow Claire and Mia through a summer of relationship building, in the present tense, week by week or even day by day. I quite loved the book and the characters and smiled to myself all too frequently as I read. I have to admit that I was hesitant to read this though, once I began, even though I pre-ordered the book immediately after reading “A Story of Now”, as sequels are frequently such a let down after the first book, aren’t they? I loved these characters, Claire and Mia, so much I didn’t want anything to happen to them or their relationship as I felt I was in the story somehow, made young again in some sort of magical romance at the same time grasping for a direction to follow as I entered adulthood. Perhaps I am too indulgent with this author in that nothing tumultuous really happens besides insecurities, ghosts of the past surfacing again in the present moment and fowling up everything so that everything must be built again. Because this relationship is an everything kind of relationship. 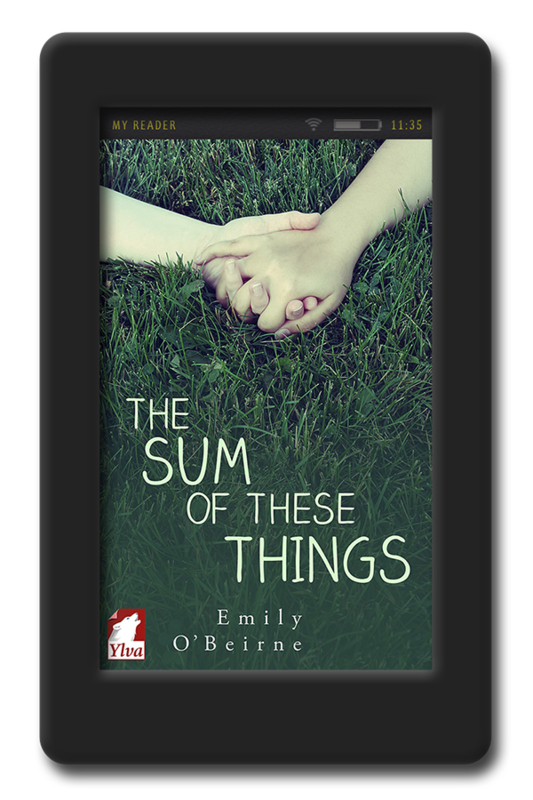 I look forward to reading more Emily O’Beirne. So. Sorry. I have no criticism of this book. I was charmed from the beginning by the characters, major and minor, and want the author funded so she can write me more stories about this Melbourne world she has created.